Home invasions, Burglaries, and at home incidents are on the rise. Protecting families while at home has become a priority that a new simple invention, “The Lock Locker”, is making a reality. In the home, we feel protected by a number of security measures that are proving to be either ineffective, or easily defeated; namely, deadbolt locks. Deadbolts have been the staple of protection for homes for years and years, but this core device is more vulnerable to risk than ever. Information easily found and obtained through the Internet, as well as a few easy purchases, can deem a deadbolt useless, and allows people with a criminal threat to compromise a lock in seconds. A quick search for “bump keys” reveals the simple way almost 90% of locks in the US can be compromised, leaving the home’s first line of protection completely vulnerable, and the precious contents within, at risk. Inventor, Greg Davis hopes to eliminate this risk with his new invention, “The Lock Locker.” The Lock Locker is a simple device that easily fits over an existing deadbolt lock from the inside, which keeps the deadbolt from being able to be opened with any key from the outside. As criminals have learned how to get into homes without any signs of forced entry, it is important to add protection to create a safe and secure home. The Lock Locker can be installed or removed in seconds and for many, will become a part of a normal home securing routine. The device works on many types of deadbolt locks and can be used in homes, condo’s, hotels, apartments, and just about anywhere a deadbolt lock has been installed. It is made of high impact material and utilizes powerful magnets to keep the parts together. The magnets also provide easy removal in case of an emergency, where seconds matter for leaving the premises. 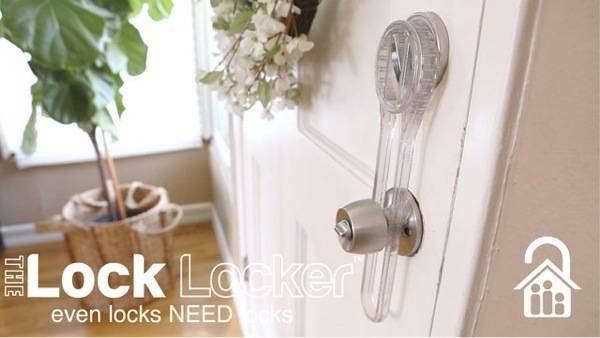 This makes The Lock Locker a safe solution to install on any door. This new invention is currently seeking funding through indiegogo to realize their goal of protecting families. The device can be purchased for as little as $19 and multipacks will save even more. If you are interested in protecting your family from the potential threat from a new breed of assailants and criminals, you can back this project and guarantee to be one of the first to receive this revolutionary product by visiting “The Lock Locker’s” contribution site. By taking the first steps in providing additional protection, you can rest assured that you are doing everything you can to keep your family safe. Wow!! that really looks like it would work, I want one.